Having neglected my poor blog for a few weeks I think it is time to share a recipe with you. 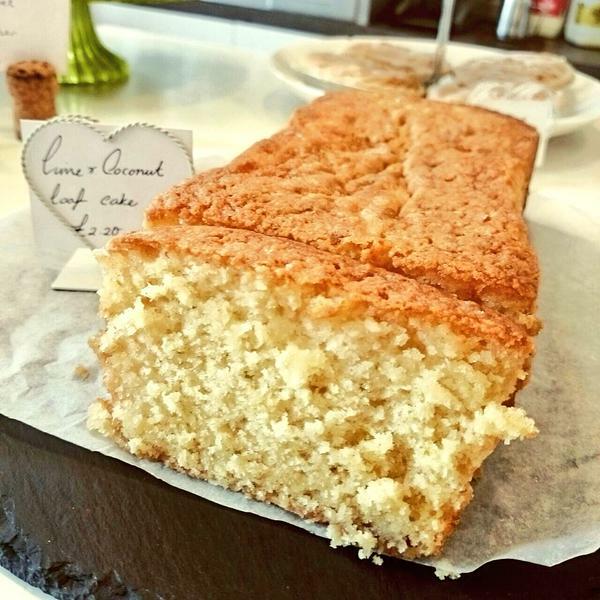 Here is one for a lovely zesty loaf cake that I sometimes make for the gorgeous Drink Me Eat Me cafe in Hammersmith. They have a great selection of cakes as well as frozen coffee and frozen yoghurt – perfect in this scorching weather. Preheat the oven to 160°c (fan oven). Cream together the softened butter and caster sugar, until pale. Slowly add the beaten egg, a little at a time, as well as the lime zest. Fold in the sifted flour and coconut, and finally add the milk or coconut milk. Spread the mixture evenly into the prepared tin and bake for approximately 50 minutes. Test the cake by inserting a thin skewer or cake tester into the middle. It is ready when the skewer comes out clean. Five minutes before the cake is due to come out of the oven warm the lime juice and the icing sugar in a small saucepan, until all of the sugar has dissolved. As soon as the cake is baked, use your skewer to make small holes all over the top of the cake and pour the syrup over. Leave to cool before removing from the tin.